Amputees often report the phenomenon of “phantom limbs”, where they can still sense the presence of missing fingers, hands, arms, feet or legs, and even feel pain where the amputated parts once were . So far, science has had no explanation for this phenomenon. Now, using ultra-high resolution imaging, researchers from Oxford University have been able to examine the brains of amputees to see how their brains change following the loss of an arm. Seeing the brain at this level of detail has revealed for the first time that amputees’ brains retain an incredibly detailed map of the missing hand and individual fingers. The existence of this detailed hand map in the brain – decades after amputation – could be part of the explanation of the phantom limb phenomenon. Sensory deprivation, for example in people experiencing blindness, deafness, or amputation, has long been a fruitful avenue for scientists studying brain plasticity. Lead researcher Sanne Kikkert, with her colleagues from the Hand and Brain Lab led by associate professor Tamar Makin, took advantage of one aspect of the phantom limb phenomenon where amputees are not only able to feel the presence of or sensation in the missing limb, but can volitionally “control” their phantom hand, too. By asking individuals to move their phantom fingers individually while having their brains scanned, the representation of the phantom hand in the brain can be mapped out in detail. Previous research has shown that moving the phantom hand creates activity in the brain of amputees , but until now it’s been difficult to say what this activity truly represents. 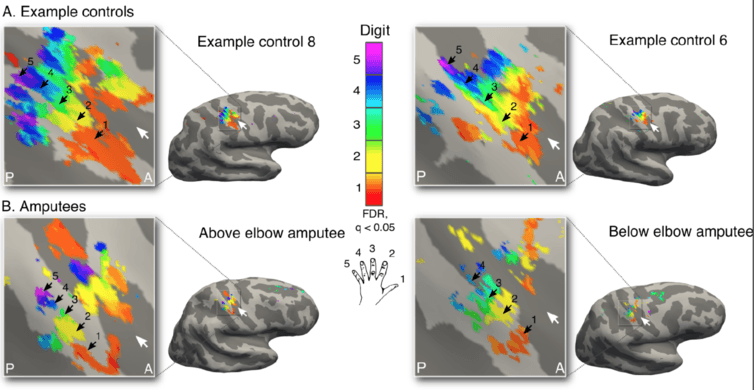 It’s difficult to prove, for example, that the brain activity indicates the existence of a map of the missing hand, as opposed to some abnormal activity due to the amputation. Kikkert’s study shows that phantom hand activity patterns contain important hallmarks of “normal” hand representation, for example the spatial layout of the fingers in relation to each other. In fact, the team was able to demonstrate the hand maps of the phantom hands were well within the range of those found in a control sample of two-handed participants. Considering that the sampled amputees lost their hands between 25 and 31 years previously, this is quite incredible. In their paper, published in the journal eLife , the researchers were also able to rebut some other, more trivial explanations for phantom brain activity. They showed that the phantom hand activation does not result simply from the activation of muscles or nerves in the remaining limb of the amputees. For example, the hand maps remained the same in amputees who were missing these muscles (due to amputation above the elbow) or who could not send or receive inputs to the limb at all (due to nerve damage). However, it still remains a mystery whether the brain’s preserved hand map causes the phantom limb sensations, or whether the sensations themselves preserve the hand map in the brain. It has long been believed that this map needs a constant stream of sensory input from the body to maintain its organisation. This idea was supported by considerable animal research showing that when a limb is amputated, the areas of the body nearby to that limb on the homunculus invade and overwrite the territory of the missing limb . Similar reorganisation has been documented in humans. A 2013 study by Tamar Makin and colleagues showed that following amputation the remaining hand hijacks the brain territory of the missing hand. Their study also showed that this take-over was related to the way the participants use their bodies: the more amputees used their remaining hand to complete daily activities, the more that hand took up the missing hand’s brain resources, probably to support the overuse of the intact hand. Kikkert found similar reorganisation in her group of amputees in the missing hand area of the brain, as well as the detailed hand maps. This means that following amputation not only is the original functionality of this brain area maintained, but it appears to be maintained despite the reorganisation that also takes place – a fact that has not previously been recognised. This could be put to use in some pretty amazing technology developed for amputees and disabled individuals: “neuroprosthetics” refers to artificial limbs that are controlled directly by the brain , usually through electrodes implanted into the cortex. The hand maps preserved in the brain after amputation could be exploited to allow individual finger movement for these brain-machine interfaces. As the team report, their findings “reopen the question of what happens to a cortical territory once its main inputs are removed” – and pose new possibilities for deeper explanations of the homunculus inside us all.